We’re here to drive your marketing growth initiative. The right offer, with well-formed value-centric marketing messages can improve marketing and sales results by as much as 47%. Often, companies focus their sales and marketing efforts on features and functions rather than value. The lack of a clear, compelling value proposition is one of the primary reasons companies fail to fully achieve their aspirations. As a result, they see less growth and lower marketing and sales outcomes because they have not differentiated themselves. If you’re still working on consistently capturing growth, we find that forming differentiated, value-based offers makes a difference. Right offers increase proactive response rates to outbound activity by 15% or more. Right offers cause an 18% to 47% increase in MQL conversions. 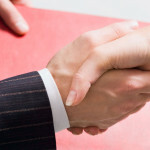 Right offers help sales deals close faster and help you unlock client budget dollars and avoid RFP cycles. Create value-centric offers for a selected solution. Define and Refine Target Personas. Research & Develop Competitive Value Matrix. Develop a Messaging Matrix to support OTM & Inside Sales. Digital Recommendations to support messaging and offers. Integrated Digital Campaign Plan to get in market and drive results quickly. In 4-6 weeks, we’ll help your team get to the right offer and take that offer to market to drive greater results. You exit the exercise with a well-formed offer, research, digital recommendations, and an integrated go to market plan to achieve a defined revenue objective for the selected solution. This program is well suited for most technology focused firms and is designed to support channel improvement initiatives and be eligible for MDF and BDF funding. Sign up today to learn more. The workshop was timely as we were considering challenging our current messaging on our website and other outlets. We chose to implement the suggestions internally and can point to several data points from SE rank, to conversions, and to actual leads coming in through the website, which were not in a sufficient place prior to the changes. 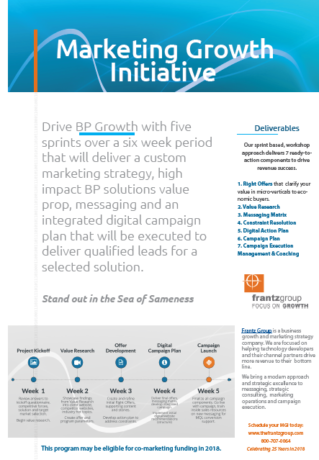 The Frantz Group worked with us to help align our offerings and messaging. After much research, John and his team walked us through exercises to help us understand the current market within the analytics landscape and focused on industry specific, value-based messaging tailored for certain industries such as retail and healthcare. This exercise helped us enhance our go-forward strategy and gave us focus areas, not only from a messaging perspective, but from a practice area perspective. Wanted to touch base to thank you for including us in the program with the Frantz Group. I have been wildly happy with the process, it has been incredibly valuable. Wish we had done this 7 years ago. Our team engaged with the Frantz Group for an MGI engagement and was provided meaningful content that was deployed on our website. This improved messaging has lead to increased traffic. We also were provided several recommendation to improve our marketing discipline. The MGI process is revealing terrific strategic insight on market messaging, just what we need to get in market and drive revenue! Along the way, your team will learn how to form Right Offers and win in the marketplace. Fast… challenging… impactful. Want to see results from the MGI? Check out our latest case study. The MGI provides the foundation for a robust digital campaign. Is your company communicating your value the way your customers and prospects want to hear and are willing to buy from? Is your unique value being carried from your business strategy planning all the way through your marketing plan and sales proposal messaging? Contact us today to learn more, or call us at 800-707-0064. Our marketing growth initiative is your starting point for success in market.